Mickey Bass 'What's News'! : Mickey Bass & "The New York Concert Ensemble"
Mickey Bass & "The New York Concert Ensemble"
Sunday August 10th 2008; features the ‘re-emergence’ of an All Star Band, which at its’ original inception featured Tommy Turrentine, Bobby Watson, Chico Freeman, Kiani Zawadi, John Hicks, Billy Hart and Mickey Bass; an All Star band, which was the ‘brain-child’ of Mickey Bass; The Mickey Bass Concert Ensemble. 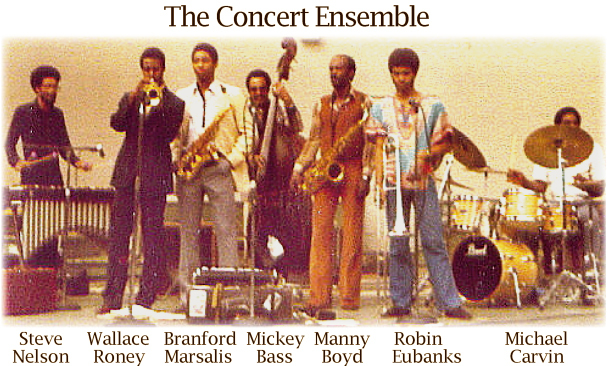 This Band was featured at Damrosch Park, Lincoln Center, and subsequently at The Bandshell in Central Park, where the configuration had evolved to feature more “Young Lions”; Steve Nelson, Wallace Roney, Branford Marsalis, Mickey Bass, Manny Boyd, Robin Eubanks, and Michael Carvin. Now after much too long of a hiatus this Band is ready to ‘re-emerge’ with another great cast of characters! Firstly; on Trumpet, is featured ‘a new star on the horizon’, he studied with Jackie Mc Lean since he was fifteen and has thus far worked with Rashid Ali, Benny Golson and Winard Harper. You’ll surely hear a lot more from him, his name is Josh Evans. Co-BandLeader and Alto Saxaphonist Rene Mclean, is the very talented son of the late, Great Jackie Mclean; a young gentlemen who has worked and recorded over the years with his Father’s Band and has, himself, been keeping the tradition alive and well. The tenor Saxophonist, Charles Davis Jr. originally 'hails' from Milwaukee, and has worked with Roy Haynes, and The Sun Ra Orchestra. Our Trombonist is an original member of The Concert Ensemble, who was also featured on "Sentimental Mood", on "Early Bird" Records. His long, and illustrious career has led him to play, and record with such Artists as Slide Hampton, James Moody, Mongo Santomaria, Lionel Hampton, Dizzy Gillespie and Aretha Franklin. He has recorded on the "Blue Note", "Impulse" and "Strata East" Record labels. We are more than happy to have him re-join us here; Mr. Kiani Zawadi. The pianist has played with Jackie McLean, and with Abraham Burton, working the 'rounds' of New York City, is 'newcomer' Allen Palmer. On Drums; our 'bombadier' is somewhat of a 'newcomer' on the New York Jazz Scene today. A recent Graduate of "The New School", who counts Joe Chambers as being amongst his 'Mentors'. This young man is fast establishing himself as one of the new talents on the scene today, he has worked with Myron Walden, Mickey Bass, Rene McLean and James Spaulding, amongst others; this 'emerging' young talent is Emanuel Harrold.
" When Mickey Bass & "The Co-operation" get in the 'right groove', the right groove being a loose, driving, up-tempo, it is doubtful, if there is another Jazz group in town that swings as hard as this one." John S. Wilson. The New York Times.